Pioneers in the industry, we offer concertina wire and concertina razor coil from India. 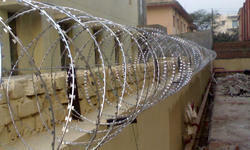 We bring forth our clients with an impeccable range of Concertina Wire. These are manufactured using a central core of high tensile wire around, which tapes razor sharp and are machine crimped. Our range is very strong and reinforced with steel coils, which makes it hard to bend. The barbed wires also have a piercing and gripping action. Moreover, these are generally used in fencing borders for security purposes. We are one of the leading manufacturer and supplier of Concertina razor coil.We obligated to meet the quality standards as per the customer demand.